Location - 132 Princes St.
132 Princes Street is located in the heart of Edinburgh’s central business district, home to some of the most respected names in finance, business, retail and leisure. The area offers a vibrant, welcoming place to work. Few places are more full of life than Princes Street, one of the most renowned thoroughfares in Europe. This destination is a magnet for shoppers from around the globe and amenities are excellent with an abundance of restaurants, bars, coffee and sandwich shops all on offer. Transport options are unrivalled at 132 Princes Street. Waverley and Haymarket train stations and Edinburgh bus station are all located a short walk away. 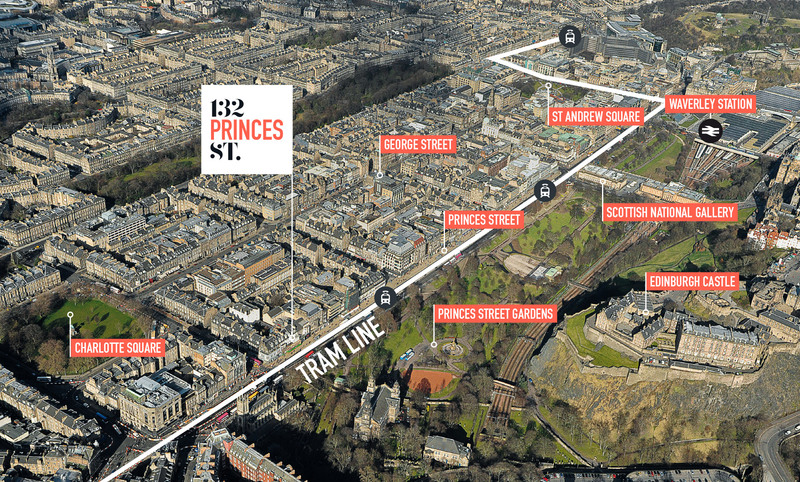 Additionally, the tram line and numerous bus routes operate along Princes Street serving all parts of the city. The building also benefits from secure bike storage and shower facilities. As you would expect from such a high profile location, 132 Princes Street is perfectly positioned to take full advantage of all that the city has to offer. The property is available now, viewings and further information are available from the joint letting agents.